Neuroscience outreach has been an important part of my graduate career. I've talked about all of this stuff here before. This post isn't about me. 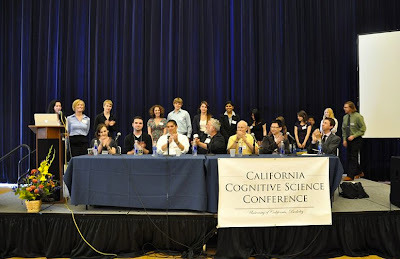 This post is, in a very small way, my attempt to thank the UC Berkeley Cognitive Science Student Association (CSSA). Over the years I've done a lot of (often repetitive) talks for them, starting with the Feel Dead Brains lectures I inherited from a fellow neuroscience grad student, Aubrey Gilbert. Every time I've done these talks the CSSA students have been super thankful and just outright awesome. Although some researchers think that public lectures and outreach are pointless (or worse), I've found that public talks are a great way to meet some extremely smart, cool people. And the CSSA has those in spades. I've never met a more motivated group of undergraduate scientists. (Hell, I've rarely met career scientists as motivated as the CSSA members.) They're certainly a lot more engaged and organized than I was as an undergrad. They've run a conference for three years now, organized entirely by themselves, and attracted speakers such as John Searle, Patricia Churchland, Mike Merzenich, and George Lakoff. It's great to see people so in love with the science, and I find that interacting with people at these kinds of public lectures helps reinvigorate my own interest. I hope that the CSSA students stay in touch through their own careers as they go on to become independent researchers.